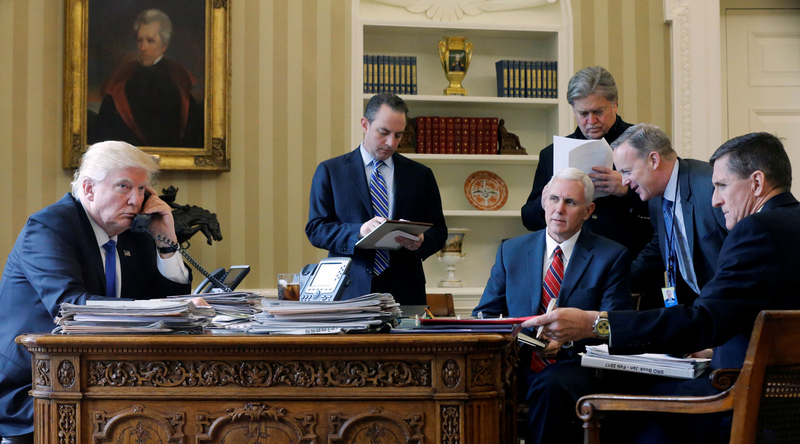 U.S. President Donald Trump, joined by Chief of Staff Reince Priebus, Vice President Mike Pence, senior advisor Steve Bannon, Communications Director Sean Spicer and National Security Advisor Michael Flynn, speaks by phone with Russia's President Vladimir Putin in the Oval Office at the White House in Washington, U.S. Jan. 28, 2017. Russia’s Foreign Intelligence Service said on Feb. 15 it would not comment on American media claims about the alleged contacts of U.S. President Donald Trump’s close associates with Russian intelligence. "We do not comment on unfounded conjectures in the media," the press office of Russia’s Foreign Intelligence Service told TASS in reply to a request to comment on reports in the U.S. media claiming that the Trump election headquarters personnel had contacts with Russian intelligence services. Russian Presidential Spokesman Dmitry Peskov also called these reports groundless. "Let us not believe in what media say, for nowadays it is very difficult to tell actual news from fake ones," he said when asked if such contacts really took place. The Kremlin spokesman added that the relevant media reports cited five different sources "but not one of them is identified, which is just ridiculous." "Let us not rely on unidentified sources," Peskov said. "These reports are absolutely groundless, not based on any facts." When answering a questing about contacts between representatives of the two countries, Peskov stressed that "working contacts are maintained." "Representatives of the U.S. embassy in Russia communicate with Russian officials, meet with foreign ministry officers. The U.S. diplomats also meet with representatives of the Russian regions, they also travel the country, which is a common diplomatic practice," the Kremlin spokesman said adding that there was nothing unusual about it. The electronic version of The New York Times claimed in its article on Feb. 14 that members of Trump’s presidential campaign had had contacts with Russian intelligence officials before the U.S. presidential elections in November 2016. According to four current and former American officials, "phone records and intercepted calls show that members of Donald J. Trump’s 2016 presidential campaign and other Trump associates had repeated contacts with senior Russian intelligence officials in the year before the election," the paper said. As the article in The New York Times said, the data on phone calls had been gathered by American intelligence agencies. According to The New York Times, the sources "would not disclose many details, including what was discussed on the calls, the identity of the Russian intelligence officials who participated, and how many of Mr. Trump’s advisers were talking to the Russians."